The Air Jordan 4 returns on Saturday when Jordan Brand releases the sneaker in the "Royalty" colorway. Jordan Brand unveiled the shoe recently as part of their Winter 2016 collection. The Air Jordan IV's unique design brought innovation to the hardwood. Worn by MJ during the 1988–1989 season, the Tinker Hatfield design now lives on in modern materials and tones. 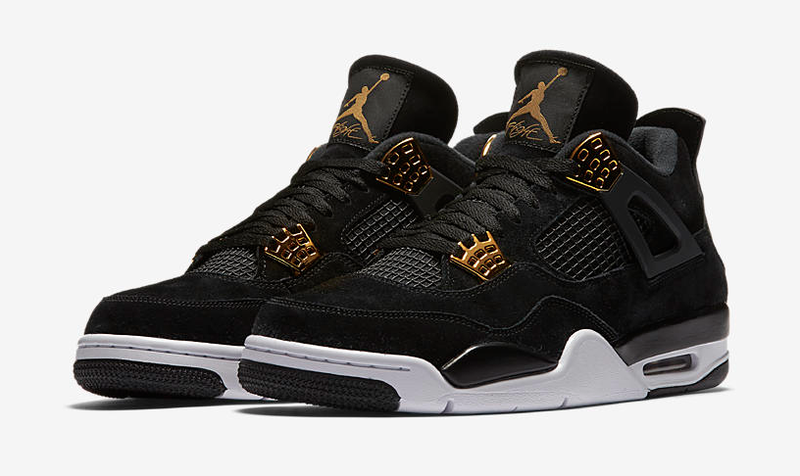 The new look comes to life in premium Black suede with luxurious hits of Metallic Gold on the Air Jordan IV's most iconic elements. The kicks will release on Saturday, February 4 at select Jordan Brand retailers. They will retail at $190 and will be released online at 10 a.m. EST at various locations. Do you plan to cop? We got early links to get you best prepared, as many people plan to be buying this release. Good luck copping!